During our stay in London we travelled to other cities around Britain to meet other mural painters as well as to paint murals .We painted the doors of the Oxford Museum of Modern Art and a mural in a youth centre in Wantage. Coming back from Britain the one thing that preoccupied my mind was to ensure that the culture of mural painting takes off in a big way in my own city. Realising the way that murals can impact on communities made me to want to see this happen in my own community. I realised that murals are such a powerful vehicle to tell local stories as well as to document local histories. I then embarked on a mission touting around the idea of painting murals among the artists that I knew in Durban. Unfortunately none of them took this seriously. One should, however, remember that this was still apartheid South Africa and not blame the artist too much for dragging their feet. It would not have been easy for black artists to find a wall to paint a mural on in Durban in 1990 let alone getting sponsorship for a big mural such as the Bill of Rights wall. It is only after I had contacted the late Terry-anne Stevenson, whom I had met about 18 months previously, to discuss the idea with her that things began to happen. I impressed upon her that there was a need for us to go out to the people and paint murals with them. She agreed with me. The plan was to work with the youth in the rural areas emulating what Malangatana had already been doing in his own homeland in Mozambique. This came from a documentary that I saw in Glasgow [Scotland ] of Malangatana building walls and painting murals on them together with the youth in rural Mozambique. This is the reason why the first mural that we painted happened at kwaNgcolosi in the Valley of a Thousand Hills. That mural was organised by Terry-anne through the Valley Trust, an NGO that has been operating in the area for many decades. These are the beginnings of a project that was later to become known as Community Mural Projects [CMP]. 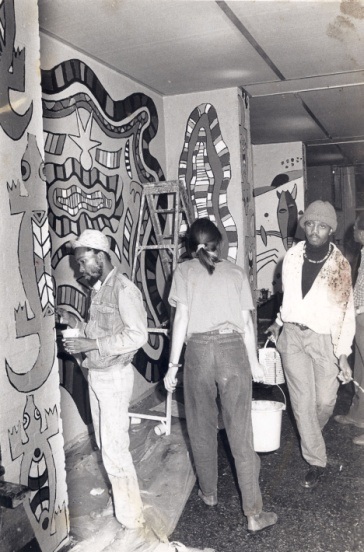 Soon after the Khayalethu mural which was painted in November 1990, Chicken On The Run was formed. 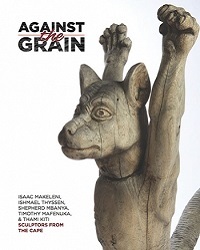 Terry-anne, Illse Mikula and myself became the directors of the project. I can remember only one mural that was painted by this group under the name Chicken On The Run. Other artists were introduced into the group. As a matter of fact one of the main objectives of the initiatives was to work with as many Durban-based artists as possible: rotating them so that everybody benefits every now and then. So this was initially a project for Durban artists by Durban artists. The mural mentioned above was painted on the walls of the then new Valley Trust Clinic with the brief that the images should inform the mostly illiterate community that use the clinic about the services that the facility provided. The Valley Clinic mural was painted in 1991. 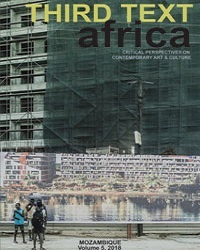 In September 1992 I relocated to Johannesburg to establish Amakhono Art Centre. When I left Durban the project changed its name from Chicken on The Run to Community Mural Projects. 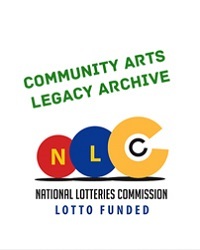 The move to Amakhono Art Centre helped to establish the project as a national initiative. Soon after the establishment of Amakhono, Terry-anne visited the centre and a few months later another mural was painted at Thisele High School in Soweto. The Thisele High School mural was painted with artists from Amakhono Art Centre. While all of that was happening more murals were mushrooming, not only in Durban but all around KwaZulu Natal. Joko Tea came on board with sponsorship for Community Mural Projects to paint murals on the walls of schools in the rural areas of KwaZulu Natal. Those became our story telling murals emulating the Joko story telling performances that were made famous by Gcina Mhlophe. I did not take part in any of the Joko Tea schools murals. Apart from the schools project, Joko Tea funded one or two other community murals. I took part in the painting of the Polokwane Taxi Rank one, painted on the wall of a Nando’s shop a few metres from the Taxi Rank. 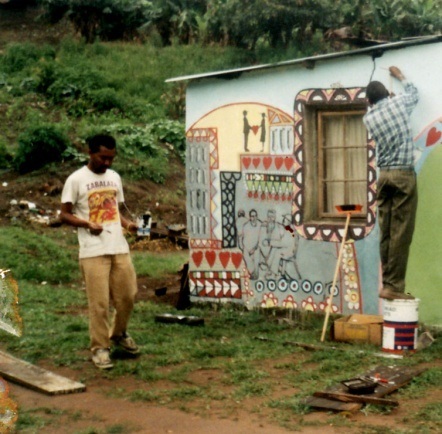 When I came back to Durban in 1994, having been away for nearly two years I again joined Community Mural Projects. I arrived in Durban in good time for me to be able to join the group in the painting of the Train Mural. With that mural we were commissioned to paint two train cars that were used to house an exhibition of works from around KwaZulu Natal that were later exhibited at the Grahamstown Arts Festival of that year. The mural was funded by Transnet. 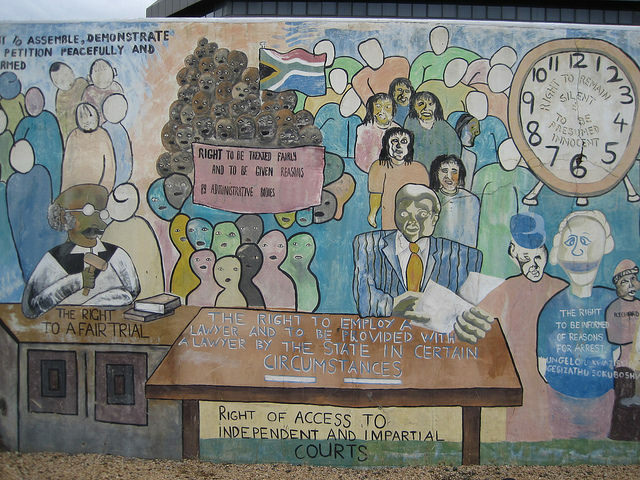 For me one of the most interesting murals that Community Mural Projects ever did is the Bill of Rights wall situated at the iNkosi Albert Luthuli Durban ICC. The Bill of Rights wall was not just a matter of putting paint on the wall, Lawyers for Human Rights led by Prof. MacQoid-Mason gave the artists a very enlightening workshop on the legal implications of the Bill of Rights on us [the participating artists] as well as on the lives of ordinary South Africans. The workshop gave us [the artists] very crucial knowledge on why, in the first place, was there a need for the Bill of Rights to be drafted at that point in time in our history. It also provided the participating artists with a strong arsenal of knowledge enabling us to approach our work with confidence. A favourite of mine is the Bat Centre mural which, sadly, was defaced sometime in 2002 or 2003. I cannot remember exactly when it was defaced as I had again left Durban in January 2000.This time going to Nelspruit to establish the Matsulu Ceramic Project. I know that the Bat Centre mural was replaced with a product that can never surpass the previous one in terms of visual impact, although it is technically a very good work of art. The first mural was very colourful with a big image of the bat as the subject matter surrounded by a lot other images that highlighted life around the city. It also gave the viewer an idea of what to expect from a place such as the Bat Centre. Without taking anything away from the artists who produced the work, I think the mural that covers the front facade of the Bat Centre does not say much about what is happening within the walls of the building. Another major mural that Community Mural Projects painted was called ‘Coming from the Kingdom’. I am not sure if this work still exists. If it does, then it can still be seen on a Newtown [Johannesburg] wall. Another favourite of mine must be the one on the wall of the Helen Josephs Centre in Galeshewe [Kimberly]. The Galeshewe mural is quite big in size, more or less the same size as the Bat Centre one. As I mentioned earlier, one of the most important elements of Community Mural Projects was our respect for local histories. Central to the Galeshewe mural is the history of the township. Portraits of three very important South Africans who have either lived or worked in Galeshewe form the theme of this very powerful work of art. These are Robert Sobukwe [the founder of the Pan African Congress] who was put under house arrest in this township, Helen Josephs [one of the founders of the Black Sash], and Sol Plaaitjie [one of the founders of the African National Congress and founder of Ikoranti yaBetswana]. 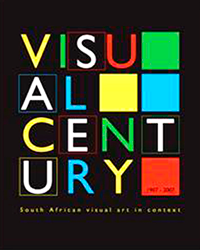 Something that people must understand and appreciate about Community Mural Projects is that those of us who have been fortunate to work with this project were afforded a chance to travel around the country and in that way learned so much about the different tribes of South Africa and their cultures. One of only two mosaic murals done by Community Mural Projects is a good example of how much we have been learning while producing the murals. The mosaics on the more than 25 pillars holding the roof of the precinct between Berea Station and the Muslim graveyard in central Durban each represent the different religions that exist side by side in the city and its surroundings. A lot of research had to be done before we touched the pillars. Muslim leaders insisted that they did not want anything to do with the Jews anywhere near the gate of their graveyard. We also got information on a group of Indians that is called the Prarah. We did research on Shembe people and their religious rites. Whenever we had a wall to paint we had to do research and quite often one learned so much about politics and anthropology. Earlier on I mentioned that Community Mural Projects has done only two mosaics to date. The first one being the Berea Station pillars and second being the one the walls of Durban Surfers Club at iSiphingo Beach. Very few people know this mural. In conclusion I want to say that there are many other murals that Community Mural Projects did that I could not discuss in this essay. It is also important to note that there are many notable young artists in Durban who were discovered by Community Mural Project.